The Richmond Railroad Museum is celebrating the first-ever Richmond Train Day 2017. On Saturday, Sept. 23, from 9 a.m. to 3 p.m., the museum will be surrounded by a one-of-a-kind locomotive bounce house, exciting kiddie train rides, food vendors, and live entertainment. Kids of all ages are invited to experience Richmond’s railroad history inside and outside the museum. Richmond favorite Markiss Blowfish and Roger Reynolds the Singing Conductor will serenade you with railroad songs all during the day. 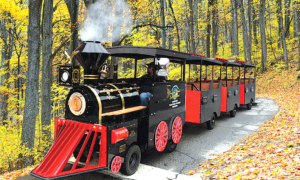 Children will have real railroad rolling stock to explore and climb all over. The museum’s coal-fired steam locomotive is a “saddle tank” engine just like Thomas, and there’s a real Seaboard Coast Line caboose to imagine what riding at the back of a mile-long string of freight cars is like. Local food vendors will prepare their favorite dishes on the cobblestones along First Street. Admission to Train Day is free, including touring the Richmond Railroad Museum in the former Southern Railway Passenger Station at 102 Hull Street. The nonprofit Richmond Railroad Museum is operated by the Old Dominion Chapter of the National Railway Historical Society Inc., a volunteer, nonprofit Virginia educational organization. The museum is open free every weekend. Normal hours are 11 a.m. to 4 p.m. Saturday and 1 p.m. to 4 p.m. Sunday. The society invites anyone with an interest in railroads to come to their monthly meetings at 7 p.m. at Hull Street Station, 102 Hull Street, Richmond. The meetings are held on the third Monday of every month. Visit www.RichmondRailroadMuseum.org or the second one on the historical society chapter’s site, www.odcnrhs.org. For more information call Ray Potter, publicity director at (804) 716-5162, or e-mail rpotter177@comcast.net.